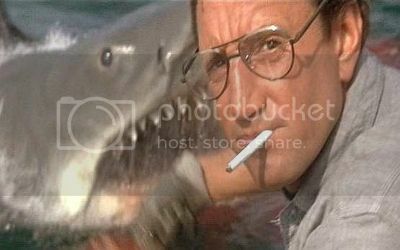 You've probably already had your fill of the news about "Jaws" being released on blu-ray from all the other horror movie websites so I'm not going to re-cover the same ground with all the boring technological stuff which I know for a fact that hardly any of them understands either. I've already reviewed "Jaws" on here so you know that I love the film and I've seen it hundreds of times over the years. What's not to get excited about with a blu-ray release of one of my favourite films? 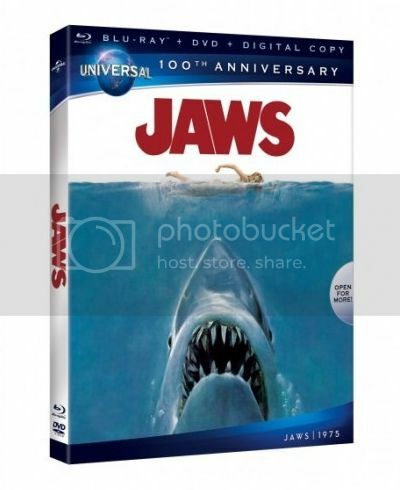 Well, like I said, I've seen it so many times and in so many formats that the new "Anniversary Edition" of "Jaws" is hardly something I'd rush out to buy. I've actually lost count of how many times it was released on VHS and DVD as a 10 year, 15 year, 20 year, 25 year or 30 year "Anniversary Edition" (either fullscreen or widescreen) and I've probably made a few of those up. Whatever the case, it was a lot of times. So what are they adding to sell "Jaws" to everyone yet again? A documentary. I'm sure it will be very interesting but does that justify buying a new version of the same film? In five years time, Universal will only bring out another version. If you've seen "Jaws" once (or twice), what else is left for you? How many times can you watch the same film? Hasn't everyone on the planet already seen "Jaws" and at least two of the three crappy sequels on TV? Some of us have even read the books! Since I don't even own a blu-ray player, all this is a moot point anyway. I'm not going to buy one for the sake of watching a nearly 40 year old film. However, I would buy a blu-ray player if the studios actually started releasing some of their other 20, 30 and 40 year old films which hardly anyone has seen. For instance, where are the blu-ray editions of "Last Exit to Brooklyn", "Scum", or "Twisted Nerve"? What's wrong with releasing some decent films instead of just the ones which the executives think will sell to the largest audience? What about the thousands of horror movies such as the ones on VHS collected by KandJHorrordotcom (on his YouTube channel) which still haven't seen a DVD release and will never be on blu-ray? These are the movies that people really want not just re-releases of the most popular titles. The movie industry is dying. Everybody knows it and horror has already been the first casualty. All this makes me think of "Demolition Man" where all the restaurants in the future are "Taco Bell". It's not hard to imagine that in another 25 years, if the movie industry still even exists, the only movies available will be "Indiana Jones", "Star Wars" and "E.T."!!! Or worse, it could be a renaissance of handycam "faux found-footage" zombie crap being burnt to 3D blu-ray at home by 14 year old amateur filmmakers who got their inspiration from classic Best Buy commercials. Sometimes, I just don't want to live in this world anymore.